Update: Today Gary Carden posted this picture of Nance Dude as she appeared in her later years in his Holler Notes. He recently acquired this picture from a distant relative of Nance’s. Nance is easily recognized as the old lady on the front row. The man on the right (or her left) was identified as her son. Gary wrote a play about Nance which has been presented on stage and is now available in a DVD recording. Interested parties may go specifically to this link for more information about how to obtain one of the limited number of copies. This book containing this legend rightly belongs under the fiction heading, but it’s so richly imagined and put together from newspaper articles and prison records, it begs to be in non-fiction as well. No one can possibly know what really happened in the mind of a poor mountain woman resulting in the plot line in the book, but after reading it I’m pretty sure you’ll never forget Nance Dude. It’s based on a murder that came to light in April 1913 when the body of a child about 2 1/2 years old was found in the crevice of a rock on Adtate knob in the lower Jonathan Creek section of the Smoky Mountains on the western side of North Carolina . Earlier, on a cold February morning, a 64-year-old woman known as Nance Dude took her granddaughter and led her up the mountain side near their home. She returned later that day without the child. She was incarcerated at age 65 and served 15 years of hard labor. But did she really murder her grandchild? You see, the particulars of Nance’s upbringing complicate the plot. The author artfully reconstructs the sad, dark story of Nance Dude from newspaper articles, court, and prison records, and talks with mountain people who either remember the crime or learned of it from their elders, showing how a lifetime of povery and degradation can sometimes leave a person facing decisions that offer few alternatives, all of them bad. I have read the ‘Legend of Nance Dude’ at least twice, and am getting ready to read it again. I have always been intrigued with such stories, especially when they’re true. ‘Dude’ is a great read, but I’ve often wondered if any movie plans are in the works, or would be considered.. I believe this would be a hit. The public craves this kind of story. has been circulating in WNC for the past five years. The woman playing Nance is Elizabeth Westall, an actress living in Burnsville, NC that has acquired a reputation for this part and is often invited to perform it theaters, universities and libraries. Oh, I quite agree with you K.D.! Maybe I should get in touch with M. Night Shymalan (Sixth Sense) to see if he would be interested. But he still hasn’t done Life of Pi. Have you read that one yet?! It’s a splendid book indeed, an example of wonderful writing. In the meantime, maybe enough people will read this book after seeing this post and interest will revive it. Let’s hope so! Happy reading. What a wonderful book. I learned the story of Nance from my grandmother (Maggie Leatherwood Stephenson) who was a first-hander of the story, having grown up in the location of the story. My grandmother was 10 years old at the time of the murder and was so affected by the events that she named her first child (my mother) after the little girl, Roberta. I too believe that it would make a great movie and I am looking forwad to reading more of the works of Mr. Stanley. Hi, I have to read the book about Nancy Dude… I learned of this book from my gandmother. Actually Nancy Dude was my great, great , great grandmother. I have heard many different tales of this story and do not agree that a 100 pound women could cause the death of Roberta Putnam all by herself. I do believe that she must of had some help but was the only person strong enough to come forward anfd confess to the crime. I was also born and raised in the location of the story and I still live in the area today. Nancy is the great, great, great grandmother of my daughter-in-law. My daughter-in-law’s grandmother is still living. I worked in a nursing home in Haywood County and one of my patients who was 100 yo at the time back in 96 told me who Robertas father was. He knew all the family’s very well. He said that this man was the one who put the rocks in front of the cave. When he told me, he was visabally shaking and disturbed. It’s great to hear from you. It’s really special to hear from so many people familiar with the case and the area Nance lived and died. This will always be one of those mysteries that become legends because we’ll never know what really happened, but I for one cannot blame Nance solely either. Like you say, she was the one punished! Thanks for writing and sharing! You are exactly right.. Her daughter ask Nance to take the child to the orphanage… On her way she seen a Preacher and ask him to take the child. I have wondered if he had anything to do with it.. No one has mentioned him.. She done what her daughter ask. Her daughter took the man over her child. Her husband didn’t want the child..
Nance Dude is my stepfathers great grandma and my great, great, grandma. I too do not believe that she acted alone in this horrible crime. I know times were very hard, but how do you leave one of your own to die? Have you heard of the photo of the cave entrance? It is said that there is a photo held by someone in my stepfather’s family, that as the years go by, faces are appearing in the corners of the photo. very foggy ones..but I have not seen it…but others have. P. S. I saw Elizabeth do her portrayal of Nance Dude a week ago at Rickman’s Store in Macon County where she had a packed house and received a standing ovation. I am new at this. I only found out last year that there was a book about Nancy Dude Better known to me as Granny Kerley as she was my great grandmother. She lived with her son and his wife(my grand parents) Will Kerkey and MINTY. Cordell Kerley on Conley’s Creek near Whittier.North Carolina Where I lived until 1958. Virginia, I’m not sure who you directed this to, but I am only the author of the blog called Wintersong. I think perhaps you are addressing one of the many commenters on this popular post. If I know a little more who you’re looking for, perhaps I can help. I’ll wait to hear more from you via this post. I guess I was trying to talk to Sharon Bradley as she has stated that Nance Dude was her stepfather’s great grandmother. I would like to know who her stepfather is. And was Lizzy his grandmother? Also Ronda Mutter says Nan Y’s brother’s name was Joseph. I know she had a brother but his name was Abe Conard. Tina, I would like to hear from you too…since she is also a relative of yours…was Nance your maternal or paternal great, great, great grandma? i live in waynesville nc and i went to queens farms about a week or two ago to ride horses and we rode up a trail where you can see the cave that the little girl was put in and we turned around in a circle were the search party picture was takin at..im hoping that soon i can visit and walk up to the cave to take pictures! [orig. posted 2008] It’s wonderful to hear from another person who knows a little more Nance a little more “personally” than just reading the book as I have. If I’m ever in that area of the mountains again, then I’d sure like to see the cave entrance for myself. But I don’t like snakes. And I’d sure like to see that photograph, too. Things like that fascinate me! Thanks for taking the time to comment, Sharon! Have you ever heard of the photo I am talking about? The picture you are talking about has been widely reproduced and the Haywood County Historical Association has a complete file. I got permission to reproduce the pictures for the production of my play, “Nance Dude,” and HART (Haywood Arts and Regional Theater) reproduced all of the photographs (a dozen) into poster-size prints which I now own. In case any of you are interested, the grave of Roberta Putnam was found recently in the Dellwood Cemetery. It is unmarked and there is a fund-raising drive going on in Waynesville to place a tombstone on her grave. I assume that everyone knows that the last known photograph of Nance with her family is currently on my blog. Yes I think they do, and they also know how to get to you to order that of that Nance Dude soliloquy you wrote. I should be able to order my copy soon. You got any left? I have a few questions… Did Nance have a sister named Kelly? Kelly’s married name MAY have been Knight. Also, What was Nance’s maiden name? I ask because I recently came across a published book of my husbands ancestery – and in a relative of his was married to Kelly and Nance Dude was listed as her sister and such. I would be very interested in hearing back from you. Thank you, Very much! I saw your questions in the comment section of Nance Dude. I’ve been spending a lot of time researching my own ancestry so I can understand how your husband’s ancestry intrigues you. Unfortunately I cannot answer your question directly. This post has been an ongoing favorite ever since I wrote it, and has garnered more comments than any other. That’s why I’ve left the comment section open. You might try–if you have a bit of time–reading through the comments backwards (newest to oldest instead of vice versa) since I remember other readers inquiring about contacting the author, and one connection did come across with email and contact information I believe (look for Gary Carden’s comments). I’d be happy to do it for you except for limited time this month. Nance’s story is intriguing, and although the book is fact-based fiction rather than biography, you may find some answers there–if you can find a copy. Good luck in your search. Candy, Nancy did not have a sister named Kelly. Her maiden name was Conard. So many inaccuracies have been told about her. Is the movie still available? Hi…My name is June Grant, I’m from Maggie Valley and when I used to vist my grandma, Ruby Grant, I would often visit with her neignbor/landlord, Mrs. Moody. Mrs. Moody had lots of old books , she would let me borrow. I was always fasinated with one particular book that had a photo of the cave with the child inside & several men standing around. I always thought it was horrible ’cause they said that the only person who would pick up that poor childs body was an old man w/ only one arm…would like to find that old book again. wrtie me back, please. I live on the Outer Banks of NC now, and don’t get up to the mtns. often (enough). Thanks. I went to your blog WONDERFUL!! dId not see photo, though, can you help??? I have a story idea on this…. If you know of any more books, or places to find articles concerning Nance Dude, please let me know…. Now I know why I’ve enjoyed writing this blog so much! It’s the leads I get from good people like you who happened by to read some of the stuff I’m interested in. Also, many many thanks for the lead to the new book by Turpin, Serpent Slips Into A Modern Eden. It sounds like a good follow up to read, as far as I can see it was published 2006 (?). I immediately started to investigate and quickly learned why the library won’t let anyone check it out. It’s for sale (I had the thought of buying one! usually I can get used ones very cheap) and the only copy I could find was $150.00!!!! You know something? It’s been a very long time since I read this book. I’m putting it on my list of “next to read.” After all, I’m more than a few years older now and I wonder if I’ll see it quite the same as I did all those years ago. I still say there were mitigating circumstances even if Nance did do it. There just might be another post about this interesting mystery. Stay tuned. Steve Brady took a picture of the grave with his cell phone. To let you know, about a year ago I visited the Haywood county library and asked about the Serpent Slips Into A Modern Eden by Turpin. The book was actually published shortly after the event. I was told it was out of print, they did permit me to make copy’s (it is only about 20 pages or so. Actually does not give out any new information that I did not know. They may have stopped anyone handling this book due to its age. Gary Carden, the renown playwright and storyteller from western North Carolina, has written an outstanding play about Nance Dude. His play is performed frequently and is one of the best I have seen. Elizabeth Westall is a flawless performer, but she is in declining health and does not often do plays any more. If you like Nance Dude, you need to check out other Carden plays, most based on true characters and events. I’m so happy to have your comment, Pamela. I just wouldn’t be surprised to see Nance as a subject in a movie someday; it’d be like I (and the other commentators here) “knew her when,” wouldn’t it? I’ll have to check this play and its author further. And by the way, I visited your blogsite and must say you’re quite a writer yourself. I intend to read all the stories bit by bit as the days go by, and one day soon I plan to add you to my side blogroll. Thanks for writing and commenting, and good luck! Let me know when and where you get published! Or perhaps you already are? just wanted to let someone know that I found a newspaper clipping in my Grandfather Bible. Thirty four years ago james a. turpin man ofrf action in law enforcement published a 80 page book called The Serpent Slips in a modern Eden. The little book now something of a collectors item for those interested in Western North cArolina. It goes on to tell what the book is about. I believe he was my Mother uncle. can contact me thru my email. Donna, thanks for your information. Sharon Bradley, another commenter prior to you, also told me about Serpent Slips in a Modern Eden. I check on it and found that it indeed is a rare book and quite expensive, although Sharon could access it through her local library. For your benefit and perhaps other commenters as well, I would like to point out that some have blogs of their own. Hover your cursor over the name of the commenter, and if they have a blog, the cursor will turn into a little hand and if you click on it, it’ll take you directly to their blog. That way you might find more information on Nance Dude directly from them. Thanks for writing and visiting. I love hearing from all of you! I’m sorry to say I have not been able to come up with a way to get a copy of Serpent Slips into Modern Eden, though I’m very interested. The only access I’ve heard so far, since it was published in 1928 and is now out of print, is through the library at Waynesville (North Carolina). I’ve seen it available for $150, a little steep for my budget! However, if you go to http://www.amazon.com and search books for that title, I found you can order a used copy of a paperback “The Untold Story of Frankie Silver,” for $16.95, or–if you don’t mind used copies, and I’ve had great success with Amazon’s used books–a used copy for $10.56. If I’m not mistaken, Turpin’s “Serpent” is about both Nance Dude AND Frankie Silver’s trials, so if it’s Nancy’s story (Frankie’s daughter) that you’re most interested in, this might be a book for you to check. Hope this helps you locate what you’re looking for. I have a photostat of Serent Slips into Modern Eden. During the last production of my play, “Nance Dude,” I placed the photostat on display at the HART Theater in Waynesville. I just spent the better part of an hour on your website, Mr. Carden. You’re a talented storyteller and I can’t believe my good luck that you happened by my little blog, and left a comment. As soon as I can I’m going to figure a way and a place to feature you on my blog, not that you need the exposure but I just like to share treasures I find online with my readers. You know, I was even tempted to join the Appalachian Folklore club. I wasn’t born in Appalachia but I did grow up in the south (the REAL south of north-central Florida) in a very similar way to the way you grew up. Problem is I don’t seem to have a lot of time anymore, but you can bet I’ll be a regular visitor now. I can’t tell you how glad I am you happened by. Randy Beaumont, a native to these parts, and i, just recently moved here, are working on a play about Nance. It has an entirely different slant from Stanley’s book. I would like to talk to anyone locally who might contribute important information about her. Unlike Stanley’s book, we want to have facts about names and events. Of course no one knows the complete answers, but i think the story is intriguing enough without embellishments. I am also a writer, having written many plays and now, two novels. We hope to get our play produced then write a screenplay to it. It would make a great movie, if done right. So if you can lead me to any of the locals who have written to you and might have information, I’d appreciate it. P.S. I saw you lived in Pittsburgh for a time. I was born and raised there. I moved to Atlanta in 1966. My book “True Globalization” is on Google Books and is available on Amazon. This is good news, Larry. If you read through the comments, you’ll see that I’ve heard from a lot of Nance’s descendants and I think they would love to see something done with this story. What I will do is go back into my wordpress files and see if I can connect electronically to these commenters and pass your email address on to them, so that they might contact you directly , should they be interested, as I’m pretty certain they will be. I’ll let you know when this has been accomplished. Yes, I was in Pittsburgh a short time (about 5 years) and didn’t appreciate it then as much as I do now–as it was my first time living away from my Florida roots. Amazingly enough, I still have a few friends there. I’ll look for your book, and wish you all the luck in the world on your Nance project. You’re in a great area for aspiring writers; many good people there! Collective Development LLC, based in Lansing MI, is currently in pre-production of a film based on this story. I hope there’s a movie made too. In fact, I’ve been thinking I need to update the post and plan to get to that soon. I’ll try to find out the status of the movie and update that information too. I recently came across the book by Stanley in the public library. It has to be one of the saddest stories I’ve ever read…that about covers it. That this woman got out of prison and still went back to that area to ‘look for a place to live’ and found only a shack to spend the rest of her lone days breaks my heart. One wouldn’t think a lot of her life could actually happen… such as being put on the road with her tiny grandchild….. must have unhinged her mind. I couldn’t agree with you more, Anne (btw, the periwinkle’s one of my favorite flowers) ! I’d like to think if Nance lived in these days rather than long ago, she and her daughter may have been more inclined to give those all-power-holding men in their lives a swift kick in the a double s and tell them it was their turn to lift a hand or two to make their lives more tolerable instead of putting old ladies and young children out in the wild. Looking at it another way, maybe the lucky one was the child who was out of her misery at least, not doomed to live the rest of her life alone and ostracized like Nance did by all accounts. Incidents like these make me wish that reincarnation is real and that Nance got another chance under better circumstances. Thanks for taking the time to leave a comment. Her real name was Nancy Curly. Who gave her the name Nancy Dude?? She lived with her son (Will Curly and his wife Minnie) on Conley’s Creek after her release from prison. My 96 year old mother is still living and the Curly family was her neighbor. Mother knows alot about this family and she tells me that they were very good neighbors. My 96 year old mother and my 80 year old brother tell me that there is too much fiction in the book and her last name was not Dude. My father and oldest brother attended her funeral. Mother can tell you what her life was like after she was released from prison because she lived in our community. The picture always comes up when I search for pictures of my family. So I read about Nance Dude on Wintersong.Minty was my Greatgrandmother’s sister.Minty was married to Will Kerley.I am kinda shocked to hear the story. How sad. If a heart can be broken, this tale is as likely to break it as if it were the best thought out fiction from a gifted storyteller. I have not read it, nor am I likely to, but I heve a better perspective on it than most except those who were personally or directly involved. Both my grandparents were born and raised in the very community in which this incident happened, and both were of sufficient age at the time to remember the particulars. It was something I heard sketches and snippets of occasionally during the time I spent as a young boy living with my grandparents during school vacations from southern New Jersey. The Jonathans Creek area at the time was a sparsly settled small mountain community of not more than a couple of hundred mostly interrelated people, so almost everyone knew almost everyone else, and those who were not in fact related to the the principles were at least familiar with who they were. I intend only to make these few comments to verify that it was indeed a real incident, and that it was a subject of such gravity (at least within my family circle) that it was seldom discussed at length. We must keep in mind however that turn of the century Appalachia was a world so different from almost anywhere else in the land (or maybe even on earth) that only those who actually lived that life have any chance of understanding the culture and day to day realities of how harsh and unforgiving existence on the very edge of survival can be. The point being that we today in a different time and in different places should make no judgements, but rather wonder at the confluence of circumstances that could end in such a heartbreaking event. Does the fault lie with a particular person, a particular group of persons, a now almost extinct culture, divine purpose, fate? We don’t know because we were not there at the instant the decision was made, and we don’t know the perhaps agonizing reasoning that lead to that instant. I do not for a moment defend any particular person involved, but neither do I accuse, I only affirm that it happened and deal with the mind picture as we all must. Lee, I appreciate so much your taking the time to respond to the Nance Dude story. It’s always good to hear from someone at least familiar with the story, and I must say we need more people who can look at a situation and respond in such a reasonable, well-thought out manner, rather than the sometimes emotional knee-jerk reaction that I too often resort to. Each life situation is different and as you point out, times are vastly different–in some ways better and some ways not so much better–but I’m reminded that if we learn one thing from this life I’m living, it should be not to judge. Thanks for visiting Wintersong, and I hope you’ll drop by again sometime. Lee, You have “hit the nail on the head” most people have no idea of how the people of the area had to live. These were very hard times, most people did not have the opportunity to even have an education because they had to work the fileds to try to have food for the family. Nancy is my ggradmother’s sister, I have been investigating doing our family geneology and have found this information to be true by talking to present descendents of the family who live in the area. After reading the other comments below I also now remember seeing a picture of the cave many years ago among some one of my family’s collection, so it’s quite possible it was one of those types of photos that were taken of crime scenes and sold to the public that was a rather common practice in that era. And I too still have family living in the Utah Mtn area. The family member who told me about this site also said Nance was related to us but he was unsure of the lineage. Lee, Nancy’s geneology have the Acuff family related via a Conard marring a Rathbone who has the Acuff connection. Excellent comments on this legend! I was recently re-reading a book by another ‘southern highlands’ writer, Sharon McCrumb, called The Rosewood Casket, and realized she uses a little girl left to perish in a cave in the book. Since she writes of this general area, I wonder if her ‘story’ (and it is published as fiction) came from the legend of Nance Dude. It did not dawn on me at the first read, but now that I have read the story of Nance, it seems a bit similiar. I remember reading about Sharon McCrumb’s nod to Nance Dude with her fiction, but I haven’t read it yet. I’ll put it on my list. For what it is worth, I saw Nance Dude when I was a child. My grandfather drove an Esso oil truck and I rode with him when he drove his routes. One of them was down the Tuckaseigee River to little settlements called Gateway, Wilmot and Whittier. We would sometimes pass an old woman on the road carrying a load of kindling on her back. She was always followed by a pack of dogs. When I asked my grandfather who that was, he told me, “Nance Dude.” She was an outcast and lived in a one-room shack with a dirt floor. Over the years, I have acquired other items. I have a photograph of Nance at a “family reunion.” As for the photographs mentioned by so many of you, all of those photographs are in Maurice Stanley’s book. My play is still done occasionally, but Elizabeth Westall has had to stop performing it due to her husband’s illness. He is in the hospital in Burnsville, N. C. The play has been done several hundred times, usually in libraries. I was fortunate enough to get it sponsored by the NC Humanities Council and they paid Maurice Stanley, Elizabeth Westall and me to discuss the play with the audience after each performance. I have a website: TanneryWhistle.net and I also have a blog that has photos of Elizabeth’s last performance up in Highlands. A friend of mine filmed that performance, but I have not yet seen the film. Such a vivid picture is conjured up by your description of that sighting. I’ve always been fascinated how people on the fringes get on in life when it’s pretty damn hard enough being what passes for normal. I’ve also checked out your blog (in my blogroll now) and TanneryWhistle where I read aloud some of your stories to my hubby’s chagrin (he was working on his mac at the time) because they seemed almost like my own. Garrison Keillor also mentioned Weird Creatures (do I have that right?) by Aimee Bailey as being a very capable writer. I’m going to look for it as soon as I finish up a little on the stack I’m working on now. Nice to hear from you again! The author’s name is Aimee Bender. I am fascinated by these stories. Some are wonderful and some are just to “oblique” for me, but it is worth the trouble to find the ones that resonate. You are wrong about Nancy living in a one room shack. With a dirt floor. She lived with her son Will Kerley in a cabin (4 rooms) and his wife. There was no electricity in the cabin until the earley 50’s my dad wired the cabin himself. Possibly the old lady you saw was Nanny Wade she always walked with a sheet tied on her back with stuff in it. I don’t know about her being an outcast There was always relatives coming to see her and my gramdparents. Nancy’s brother Abe Conard. Her daughter Lizzy and her kids and grandkids. I don’t mind fiction when it is wrote as fiction like Maurice Stanley’s book but I do mind when things are said for facts that I know are not true then I do mind that. Better yet, just come and join my blog hollernotes.blogspot.com/ Just click on “Follower” at the top of the page. Do you know that Maurice Stanley recently did a little book on Frankie Silver? It was published by a small press and has not give much publicity, but it is out there. I reviewed it on my blog six months ago. It is called Midwinter. Now, a title like that will go very nicely with you blog! Let me know if you have trouble finding it. I did not know this, Gary. Thanks for telling me about it. I actually found two copies on Amazon.com, one new and one used, and put in the cart but haven’t ordered it yet. I have a book with her story in it around here someplace, but it was very dry reading. I think Stanley would do a much better job of weaving a story out of it. I see you are over here and sharing stuff as I hoped! These mountains ‘happenings’ are well-covered, it seems. Sharon McCrumb wrote a whole book about Frankie Silver and it was hum-dinger! I would love to read Stanley’s words about Frankie, if anyone can locate them. Somehow I can’t really ‘see’ Frankie tho…the way I can ‘see’ Nance Dude, wood on her back…the stray dogs the only beings that spoke to her. You two are going to make my reading list grow by leaps and bounds. I need to look for Sharon McCrumb’s version of Frankie now! It sure is good to hear (albeit indirectly) from you again Anne. My books are available at the above website! Click on links. Click on ‘links’for my books! how’s the nance dvd coming along? Your choice for the DVD cover is certainly the best.Elizabeth is so loveable and photogenic, and she is in color! I wish you the best with it. Will I see you at the book fair in Sylva, Nov. 14th at the United Methodist Church…? If I survive this bee sting that I got a few days ago. I’ll be there. The Smoky Mountain Book Fair is sponsoring “Prince of Dark Corners” the night before the Book Fair (the 13th), so I will be at both events. I wish it was Elizabeth doing “Nance Dude,” but a fellow named Stewart over at ASU has written a book on Lewis Redmond, so I’m set up to discuss the “dramatic” Redmond as contrasted with the “hostoric” Redmond with Steward…..and the audience. I’ll be ordering the DVD from you soon. I think it’ll make a great BD present to myself…the story of an outcast, who may have committed murder, a family who sends aging women and toddlers out walking in the wintered mountains to find the ‘poor house’. Okay…..so it may not be cheerful. I still want it. Thanks for letting us know here where it can found. Gary, looks like you’re going to get that new furnace. Well,it isn’t a furnace. I just want a big load of firewood (oak) the feed to my little soapstone stove this winter….but, yeah,you are right, I will probably make enough to buy the firewood and maybe fix a couple of leaks in the roof. I am beginning to get orders by mail and the local bookstore has agreed to give me a “reception” on December 3rd. Please tell me about the Appalachian Folklore Club. 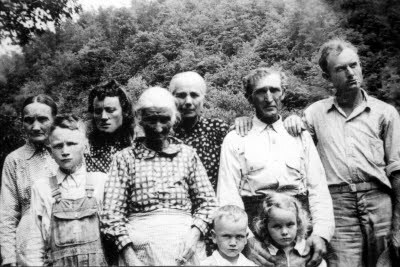 I am from appalachia….grew up there and know a bunch of hair-raising tales, and want to share them. I recall Gary indicating it wasn’t very active now, but that could have changed by now. Now this could be something different, but it’s a link to the Appalachian WRITER’s club: http://appwc.proboards.com/index.cgi? Happy 2010 to Alice and you bloggers out there. I bought a copy of Midnight myself just before the onslaught of the holidays, Maurice. Because of the intensity of activities, I only got about half way through before I had to put it away. It’s quite a riveting tale in itself. If I were starting out now, these tales might have moved me into a study of women and crime and punishment juxtaposed on legal and societal expectations of women over the centuries…. Since I’m too old for that now, I’ll read yours and other books like them. Wouldn’t Nance Dude and Silver be surprised they became famous (or should I say “infamous”)? Hi Alice, Gary, Maurice, everyone! It is a very interesting thought of “What-iF”….what if Frankie Silver knew she had the sympathy of nearly every woman of the 20th and 21st centuries, altho the disposal was kind of gruesome! (I said that wryly!) What if Nance Dude knew there were people who would have taken her in and kept her warm and well-fed in the winters simply because she was a person. Gary, I cannot find Nance’s pix on Tannery….directions, please. Yes, Anne, interesting what ifs. I like to think that things would have gone a little differently. I guess when you say “Midnight,” you mean “Midwinter.” I haven’t read it yet, but it is in a stack of some 30 books I intend to review, so I will get to it. Maurice gave me a signed copy at the Smoky Mountain Book Fair. I have an old book on Victorian murders and it is filled with women who hanged for killing abusive husbands. I doubt that a one of them would serve time now, much less actually be executed. There are some fascinating “sensational” murders in my collection of American crimes in the early 1900s and most of them would get a week’s coverage now. I guess we have become jaded and/or more tolerant….except for the murders of children. Exactly! Midwinter. I keep making that mistake like there’s a kink in that part of my memory somehow. Must remember! Must remember! Midwinter! Midwinter! Midwinter! For all you who haven’t read it, get a copy now. Look for Maurice’s comments to find out where and how. I have always been interested in the Nance Dude story. I was born and raised in Haywood County and live there now. My grandmother was born in 1913 and was named after little Roberta Putnam, so I grew up hearing of the tale. I am thrilled to see the interest in the story and folklore of this area. Many people who are natives to this area are unaware of the Nance Dude story, a sad truth that the past is being forgotten. I have taught my children the story and they have read my copy of Maurice Stanley’s book. Now they are going to school and passing the story on to their peers. Hopefully a new generation will become aware and have interest in the rich history of the area of the appalachians in which we live. Hi Tina. I’m glad you found your way into my Nance Dude post. I discovered the legend accidentally when I was at a Tennessee folk museum, the name escapes me now, but in the gift shop I found Stanley’s book and have now read it twice. I continue to be intrigued by the story and am happy to find others, especially those around Haywood County, who are interested too. Thanks for stopping by my wintersong, and I’d be happy to see you back anytime. Especially thank you for taking the time to comment. If you hear anymore news, about the movie or another book or something, please let me know. Some local musicians have written and recorded a CD of songs all about haywood county including one about the Nance Dude story. It’s entitled simply Songs from Haywood County by Buddy Melton, Milan Miller and Mark W. Winchester and the single about Dude, is “Poor Child”. It was released in 2009. Very interesting and lots of Haywood County history included in the songs. Thanks for letting me know about this, Tina! I love the old-time country music, and this gives me something else to explore. There used to be a couple we went to hear in Cosby, Tennessee. Can’t remember their names right off the bat but they made an album Porches of the Poor. Does that ring a bell with you? Thanks again for sharing. I want to make an observation to all of the posters who claim to be descendants of Nance Dude, many of whom question the authenticity of Maurice Stanley’s book (and my play). Both works are fiction. They are not documentaries or biographies. Both Maurice and I fabricated and took liberties with the facts. I certainly did. In my play, Nance Dude talks for over one hour. In actual fact, Nance never spoke during her trial and rarely spoke elsewhere. Gary, sorry I missed the opportunity to make this observation about both works being fiction myself, so I’m especially glad to have your comment. I’m always astounded at how much web-traffic Nance Dude generates. I’ll bet she’d be confounded herself at it, wouldn’t she?! I’m sure she would be totally bewildered just as she was by he mysterious orchestrations of the Haywood County legal system. Maurice teaches at UNC-W in Wilmington, N. C.
In response to the inquiry about the possibility that Nance had a sister….no, I don’t know anything about a sister. However, in regard to your inquiry about Nance’s maiden name, I believe it was Conard. Her married name was Kurley (sometimes spelled Kerley). Ronda, I came across this fascinating blog talk while trying to research the Conard line from around Waynesville. In your research have you seen the name Leona Conard who married Thomas Franklin ? They had ten children, I know of. One was a twin named Doyle, born in Waynesville in 1950. That is my grandchildren’s great-grandpa on their father’s side. Just helping to build their ramily tree. We are in South Jersey, but the Franklins moved up here possibly about 1960 or so. Now I am wondering if their family tree sonehow involves this fascinating tragic woman, Nancy Dude. Thank you! You are right her name was spelled Kerley. I really am her great grand daughter. She lived with my grandparents on Conley’sCreek near Whittier NC. I never heard of a sister either but she did have a brother. His name was Abe Conard. Abe and his wife Hettie would visit Nancy and her son Will Kerley and his wife MINTY quite often when I was a little girl. Lizzy and her son Fred would also visit often. I don’t know why this is upsetting to someone. I had heard the story that Mr. Stanley wrote all my life. Before and after Nancy died. I was 8 years old when she died. I have been talking to Liz Petty about this and it is exciting to find people that I might be related to. I also found among my old pictures the very same one that is on Wintersong. I don’t know who might have taken the picture as my grandparents are in the picture and I am pretty sure the little girl in front is my mom Ruth Kerley Moulton. Hi daughter of Ruth Kerley Moulton, Virginia Marchand,, I found this blogsite when I was looking for a picture of my great aunt Minty .I am working on my family tree, and I just found out this morning that a Ruth Kerley was born in Omak WA. This is where my Greatgrandma, Mattie Cordell was living at the time you were born. So we are relatives !!!! I am pleased to meet you and hope we can visit again. My email is rlw82428@yahoo.com and my phone is 360 683-0112. I know so little about my Grandma Alma’s family. Hmmm… I’ve read about Nance over the years and naturally heard the story told many different ways. It has always saddened me on different levels and tugged a part of my heart. Since my ancesters knew, wrote and talked about Nance Dude and what happened, it’s always intrigued me. If I can locate the person with my great great great grandfather’s belongings, a lot of my questions will be answered. He was active on the search for the child and was a neighbor and friend of Nance and her family (if my memories serves me correctly). Finding this on my husbands family tree just made me want to dig out what I could. If you happen to have any more personal information about her, such as DOB, DOD, parents and such if you’re willing and able to share that, I would really appreciate it a lot. I have a photocopy of the Turpin book and found it to be an unpleasant and highly opinionated treatment of several women’s crimes, including Frankie Silver who allegedly killed her husband with an axe and burned his remains in the fireplace. Incidentally, Maurice Stanley wrote a book about this one, too. You can probably download all of the pictures associated with Nance Dude from the internet. They are also available from the Haywood County Historical Association. I have a complete set from the Haywood Bicentennial Celebration when my play was produced at HART. Incidentally, these are the same photographs that are in any copy of the Stanley book. I have read the book “Nance Dude” and I loved it. I felt so sorry for Nance and I do hope that she had some happy times in her life. I don’t think Nance left her granddaughter in that cave,but if she did, I think it was because she didn’t want Roberta to have to live the sad, hard life that she did. We just spent a wonderful week in Bryson City and we found the graves of Nance and Roberta and put flowers on each grave. My son just finished reading the book and couldn’t put it down until he finished it. He said he never liked to read before but with this book he felt like he was right there with them! Hi, I am a decendent of John Hannah…Aka Dude Hannah, I very recently found out about all of this and I would like to know more. John is my great great great Uncle, his brother Milas is my great great grandfather. http://www.findagrave.com/cgi-bin/fg.cgi?page=gr&GRid=71083992 ….. This is a link to a virtual copy of Roberta’s grave, you can leave virtual flowers and such on it. The pictures referred to are easy to come by. I have a complete file myself. As I have said before, the Haywood County Historical Society has a complete set of the “Nance Dude” photos. I am new at this so bear with me. Stanley I wrote you a letter but maybe we can connect on Yahoo. Looking toward to hearing from you. Alice, Your blog has been invaded by harpies. The nasty and petty folk have taken up residence. I’ve been becoming increasingly disillusioned by the tone of some of the posters, and I am a bit nervous by the “fervor” of some of the posts. Too many posts by folks that have become authorities on topics that I no longer recognize. Makes me think of the irrational posts on the Popcorn Sutton blogs where people rave about the character of a man that would be bewildered if he could read the comments. I tried to post a message but the blog kept rejecting my messages. Forgot my password. I think I will hang it up since I no longer identify with the people posting here. Somebody poisoned the well. email address from this blog. Even if you are remove d Gary I still have to say this. No one room shacks. She did live with her son Will Kerley. I was there. They lived up on the hill above the creek and my family lived down by the creek in ahouse owned by Essie Conner until my dad and grandpa built us a log house. I was eight yearsold when granny Kerley died.If you were not there you don’t know what you are talking about. Why areyou weary of it? Is she a relative of yours? P. S. Nance’s death certificate is in Maurice Stanley’s book along with the official dates. Nancy was born on July 20, 1848 and died on September 12, 1952. She had 5 sisters, Martha (My ggrandmother), Catherine, Mary Jane, Maranda and Sarah Elizabeth. Her brothers were: John, James, Abe, and Lawson. John conard was my great grandfather George w Conards dad his daughter Irene conard was my grandmother. Thanks for stopping by Sandy. Well, Virginia, I bow out. You obviously know more about it than I do and all of the people I interviewed just plain lied to me. My grandfather lied to me and the pictures that I have of Nance are forgeries. Get me out of here! Get in touch with Liz if she wants to share the pictures I sent her that’s fine. The pictures prove that she was with her son and his wife Will and MINTY Kerley well I don’t know how old my mother was in the picture of Nancy my grandparents and my mom but she was born in 1916. WINTERSONG OFFICIALLY CLOSES THE COMMENTS FOR THIS BLOG. Alice I am sorry that Gary is offended that I dont agree with him. I just know that some of his info is wrong. Nancy lived with my grandparents in a cabin (with floors) even before I was borned. 1944 I I remember her always being there with them until she died in 1952. I have pictures of her with them when my mother was young. Anyway I did not mean to cause any trouble for you. I just get a little defensive when I know the facts aren’t right. Alice, are you there? I’m having trouble getting to you. Hi Gary, I’m here! For about the last six weeks I’ve been mostly away from home traveling and being sick. I’m not quite fully recovered but feel enough better at this point that I’m pretty sure I’ll be back online pretty soon. Sorry you’ve had problems getting to me. I’ve left messages for you on Facebook (weeks back); don’t know if you got those, but I haven’t been there either for a long time though my hubby has (he uses my account to keep up with his family). If you still have my old email contact, you can still use it. I’m online at least once a day now. Merry Christmas, Alice and Gary!!! I happened to be re-reading this page again, and had commented when I first read the book and was fascinated, saddened, and angry with the stepfather and mother of the child as well! Nance and the child going away from the house that day? Obviously I need to re-read the book!! Keep up the good work, it’s a heck of a story in the telling! So sorry, I was reading top to bottom and didn’t see the “Closed” notice in time. Not to worry, Anne. Thanks for reading. I just ordered Maurice’s book about Frankie Silver. When I’ve absorbed it, perhaps we can discuss it!! I wanted to share a different version of the Nance Dude story–it’s a bit at odds with the one you have heard and told before. My version is dedicated to all of those folks who said Nance Dude never committed that horrendous crime against her granddaughter and was unjustly accused. I would like to hike to the cave and just wondering if this is possible? I’m not really sure, Jamie, as I don’t actually live in that area of the country, but I suspect you could if you can find someone to map it for you. The comments on this post are quite long and would take a long time to read in total, but I sort of remember someone mentioning having done that hike. You could check it out if you like. Good luck, and write about your experience if you do. I recommend that you not ask Mr. Davids who has offered up an different ‘version’ as he calls it of the the story of Nance Dude. I’ve read his version, he wanted it read as he submitted it; however he does not want it questioned in any way. I am sure he does not know the path to the cave. When he’s asked questions, logical questions– not snark, about his ‘version’, he simply deletes them and repeats that he’s standing by his story. His unwillingness to address queries is a large flag marking deception. Not only does he delete posts that simply point out his dates are incorrect; he will send back a cryptic little post to you via email and then rush to delete that also from his page so no one else will read about how petulant he is when challenged. Enough already, I now am convinced, because of his dodging, that there never was an Interviewed Roberta (imposter) but rather he invented the entire story out of whole cloth. So be it. I found your blog via a Pinterest pin of your your squash recipe. Who knew it would lead me on an adventure? I found Nance Dude Legend on your blog on Wednesday, 7/2/14, and decided to order it on Amazon. Because I was leaving town to spend the 4th at my mountain cabin, I decided to wait until I got back home to order it so I would be here to receive the package. Strange things happen. On the 4th of July I walked into a book store in Bryson City, NC. Guess what book was the FIRST book I saw when I walked in the door? You guessed it! I knew I HAD to read this book. I took it back to the cabin and read it. I was shocked when I realized Nance Dude, a/k/a Nancy Ann Kerley was buried just down the road from my cabin! I found her grave. I wish there was a way to post the photo of her grave. I can’t get this woman out of my mind. It’s a tragic story. Thank you, THANK you for recommending this book. Renee, that is just so cool! A bunch of us were fascinated with the story; and find Nance’s life and story to be unforgettable; much the same way anyone who saw “Sling Blade” could never forget the character, Carl. Except Nance was a real person, and Roberta was a real child…and the facts of their last day together are just lost forever in the sands of time. I have enjoyed reading this blog, top-to-bottom. My niece loaned me the book “The Legend of Nance Dude,” two years ago, and I found it so fascinating I read it straight through then, within a day. It tells a troubling story, and is very well written by Maurice Stanley. I just wanted to make one side comment, and that is to note that the name of the highly acclaimed author of “The Ballad of Frankie Silver,” “The Rosewood Casket,” “Ghost Riders,” “The Song Catcher” and a number of other wonderful books situated in the mountains of southwest Virginia, southeast Tennessee and the northwestern portion of western North Carolina, is Sharyn (not Sharon) McCrumb. Though her books are fiction, they are often based on real events, which Ms. McCrumb has meticulously researched. I highly recommend them, especially the Ballad Series books. Seems there has been no update since 2009. Is there a movie? How about the plays that were popular years ago? Any plans for more?